Mark Phineas Chamberlain, 75, a long-time Laguna Beach resident, possessed an adventurous spirit that animated his life. That spirit morphed into an unquenchable desire to protect Laguna Beach and the larger world through photographic, environmental and installation art and through his curation of numerous exhibitions in his Laguna gallery, BC Space. Born in Dubuque, Iowa, to parents Donald and Elizabeth Chamberlain, he grew up with older sisters Sarah and Belle, and younger sister Mary Beth. From an early age, he explored the hills and bluffs bordering the upper Mississippi River, and rode a variety of boats through its streams and channels. The athletically gifted youngster also delighted in climbing the town’s trees, and riding his bike up and down its hills. Mark Chamberlain and Liz Goldner are among the bystanders at a protest on Main Beach in August 2017. Photo by Ken Kleinberg. His father, an insurance agency owner and descendent of Peregrine White—who was born on the Mayflower in Plymouth Harbor—demanded that Mark develop an expansive understanding of the world. Donald tutored his son, often sending him to the home’s unabridged dictionary to look up words. This ritual became the genesis of Chamberlain’s impressive abilities as a wordsmith, and helped him succeed in a variety of cerebral endeavors throughout his life. Chamberlain became an avid reader, enjoying stories of boyhood adventures, particularly those by Mark Twain. He took on the moniker McHuck, reflecting his love of the river. At age 9, he contracted polio and remained home for nearly a year, while his mother helped cure him through the Sister Elizabeth Kenny approach to muscle rehabilitation. His mother’s devotion became the basis of his belief in women’s rights. With his interest in world affairs, he received a bachelor and master’s degrees in political science and operations research, respectively, from the University of Iowa. In Korea, “I picked up a camera primarily to keep my sanity and provide an outlet beyond the more common practices of drinking, whoring, and gambling,” Chamberlain often explained. “I also took classes in the Korean language and history and found a photography instructor in the military crafts program. Mr. Chae became a real mentor, teaching me darkroom techniques and forcing me to examine deeper meanings in my photographs.” He also roamed the cities and countryside, conversing with the local people while photographing their lifestyles. “Returning home, I could not find the threads of my previous path,” he said, “yet I had a growing desire to find an outlet for this newfound passion of photography.” In 1969, he packed up his MG Midget and headed to Los Angeles, aspiring to open a photographic art gallery. When those plans fell through, he relocated to Laguna Beach in 1970, “a community that reminded me of the Midwest.” Along with photography, he supported himself as a housepainter, carpenter and electrician, developing skills he later employed constructing BC Space. 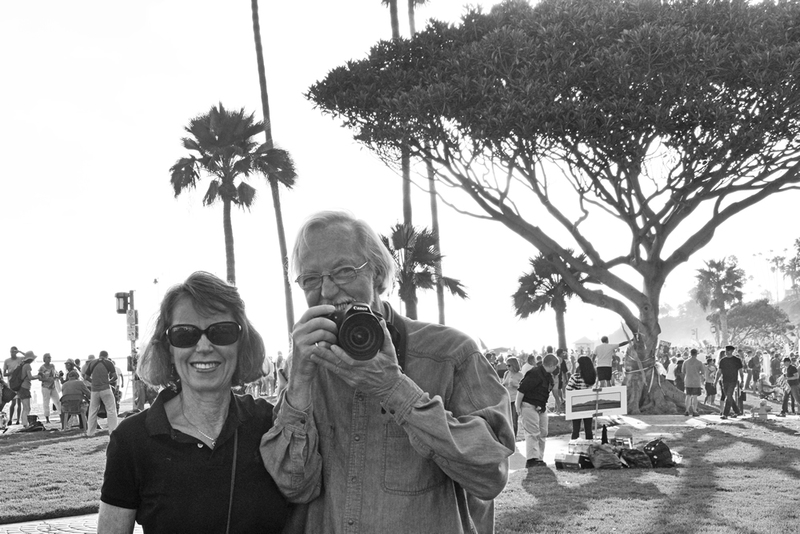 With art partner Jerry Burchfield, Chamberlain opened BC Photography and Custom Lab Services on April 1, 1973. In that 1,000-square-foot space, Chamberlain and Burchfield shot and processed film for commercial clients, galleries, museums and artists. They also presented photography exhibitions, displaying a wide range of work, many infused with political, social and environmental messages. The project’s largest and most dramatic phase was “The Tell”photomural. This giant work of “artivism,” as Chamberlain described it, was constructed in 1989, seven miles into the canyon, across from the Irvine Company’s proposed Laguna Laurel housing project. “The Tell” was built as a small mountain, composed of thousands of photographs, reflective of the people who donated their images. It grew to 636 feet long and a height of 36 feet high before dwindling to the ground. After Chamberlain assumed sole ownership of BC Space in 1987, he expanded exhibitions to other visual and performance media. “Ideas and issues expressed through art became more important to me than just one medium,” he explained. He explored controversial issues, including art as an expression of our deepest yearnings; the shamelessness of healthy sexuality; societal evolution; politicsand economics; the defamation of indigenous peoples; the hell and hypocrisy of war; and environmental concerns. Burchfield and Chamberlain’s documentation of Laguna Canyon led naturally to their creation of “The Legacy Project,” which documented the evolution of the Orange County Great Park. In July 2006, Legacy Project members converted a jet maintenance hangar into a camera obscura. With this device, they created “The Great Picture,” a 3,375-square-foot photo, portraying the control tower structures and tarmac of the former air base. The Guinness Book of Records certified the project’s camera obscura as the largest ever recorded. Chamberlain continued to curate shows and photograph the artwork of others in BC Space, until sickened by lung cancer in January 2018. Yet, looking back, when he was alone, shooting and printing images, BC Space was his sanctuary, where he graciously welcomed clients, artists, and friends who stopped in. Chamberlain died early on April 23, 2018, after a weekend filled with visits from friends and relatives at his bedside in an Irvine hospital. He is survived by his sisters Belle Chalmers of Laguna Niguel and Sarah Knapp of Dubuque, Iowa; former wife Susan Rederus Chamberlain, and son Austin Rederus Chamberlain, both of Santa Ana; five nieces and nephews; and by his partner Liz Goldner of Laguna Beach. Public services are planned, but not yet finalized. This is a wonderful review plus more of Mark’s life and as I knew him through you, I can see clearly what a wonderful connection the two of you had. I am so happy I got to see him just before he passed on. Of all the events I was involved in with Mark, one of my favorites was his Winter Solstice Celebration, or “shortest day of the year,” held on the boardwalk at Main Beach. Like a unified tribe of divergent individuals, with Mark as head shaman, we noted the sun’s eight-minute dip below the horizon,signaling a new year and new possibilities.